These decadent bars won the very competitive family cookie contest last year. I dipped them in chocolate for the contest, but I don't recommend that unless you need a huge win. They are plenty rich without an extra coat of chocolate. 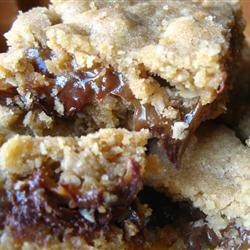 The caramel sauce makes the difference between these cookies and other oatmeal chocolate bars. It adds a depth of cooked-sugar goodness that you can't get any other way. Preheat oven to 350°. Grease or spray a 9" x 13" inch pan. Lining the bottom with parchment is optional if you need an absolutely smooth removal of bars. Combine the following. The mixture will be very crumbly. Press half of the mixture into the bottom of the prepared pan. Bake at 350° for 10 minutes. Let the crust cool slightly (about 10 minutes) then sprinkle the chocolate chips and chopped nuts over the crust. Mix them together before sprinkling over the crust. Mix the following together and then drizzle over the chocolate chips. Top with the remaining oatmeal mixture. You will need to break it into small pieces to cover. Bake at 350° for 15 minutes (until golden). Let the bars cool before cutting. Timing: Between 45 and 60 minutes plus cooling time. This doesn't count what it might take to make vegan caramel sauce.